Donuts have always been one of my favorite treats (can you blame me?). I definitely have a few favorite spots to pick up a dozen glazed with sprinkles, but sometimes it's extra fun to make your own. It fries up amazingly and you can make your own dough or simply use a can of the Pillsbury kind -or Trader Joe's makes delicious ones as well. That's what I used this time. I just used a heart-shaped cookie cutter to shape the dough into Valentine hearts. I flattened the dough out a bit first -if it's too thick, your donuts may end up doughy in the middle. I then placed them into a frying pan with about an inch of hot vegetable oil. The hardest part was getting the temperature just right. If you have a candy thermometer, you'll want the oil to be about 350 degrees. If you don't have a thermometer, use any extra dough (or weird shaped donuts) to test the heat of the oil. My stove worked best set at med-low. Cook each donut for about 45 seconds on each side (I flipped mine using tongs) until golden brown on each side. Place cooked donuts onto paper towels to soak up extra oil while they cool. Once they have cooled off, you can decorate! 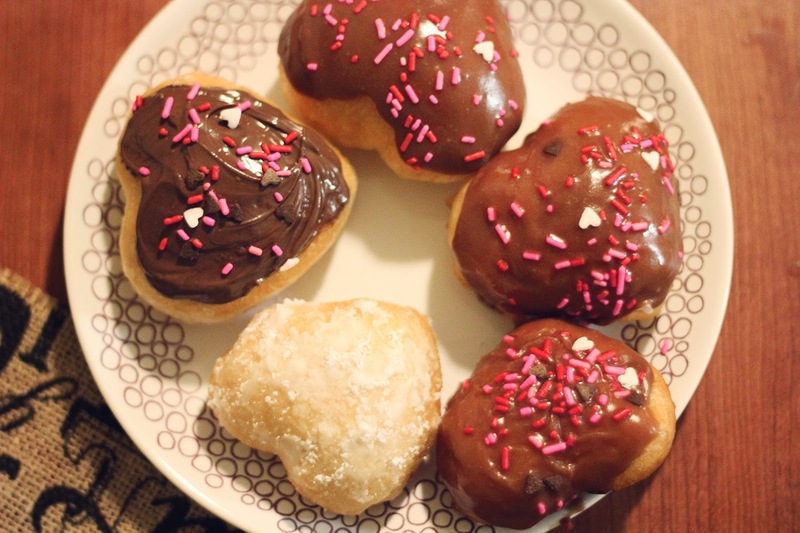 I sprinkled some with powdered sugar, frosted some with Nutella, but dipped most of them in chocolate glaze. Combine butter, milk, corn syrup, and vanilla in medium saucepan and heat over medium heat until butter is melted. Decrease the heat to low. Add the chocolate and whisk until melted. Turn off heat. Add the powedered sugar and whisk until smooth. Wow! Those look so yummy. I am going to give these a try. Thanks for the glaze recipe.